Installation of the first new storefront glass. 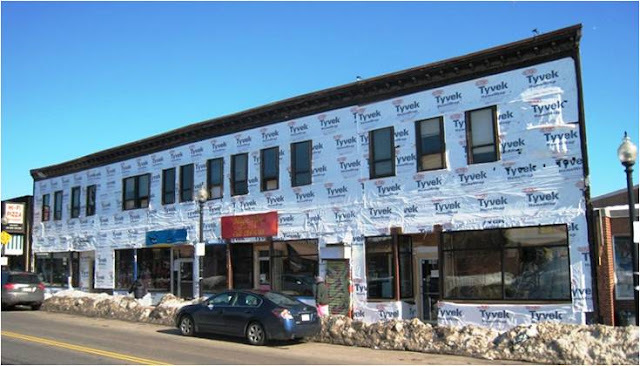 ﻿Construction began on the Golden Building in Fields Corner on December 29. In spite of the worst winter weather in recent memory (see our recent blog post about construction during winter conditions), contractor Kevin Piccinin and his crew K&B Contracting have made great progress, as the series of photos below demonstrates. 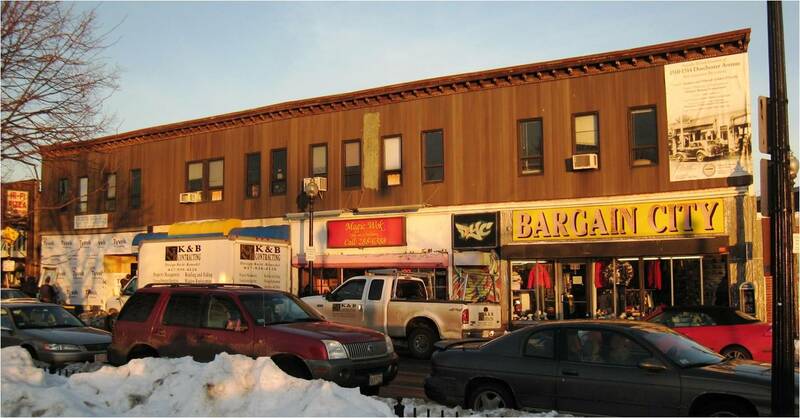 Since the building has remained fully occupied during construction, HBI Senior Program Manager Jeffrey Gonyeau and building owner Stephen Golden have worked closely together to keep the retail and office tenants of the building as comfortable as possible as the old, unsightly storefronts and windows were pulled out and replaced with high-quality and energy efficient new units. While there have been some chilly moments, we think everyone agrees that the complete exterior transformation of the building has been worth a bit of temporary discomfort. The bulk of construction should wrap up in the next three to four weeks; exterior painting and the installation of new tenant signage will happen as soon as the weather warms up sometime in mid-April (hopefully!). 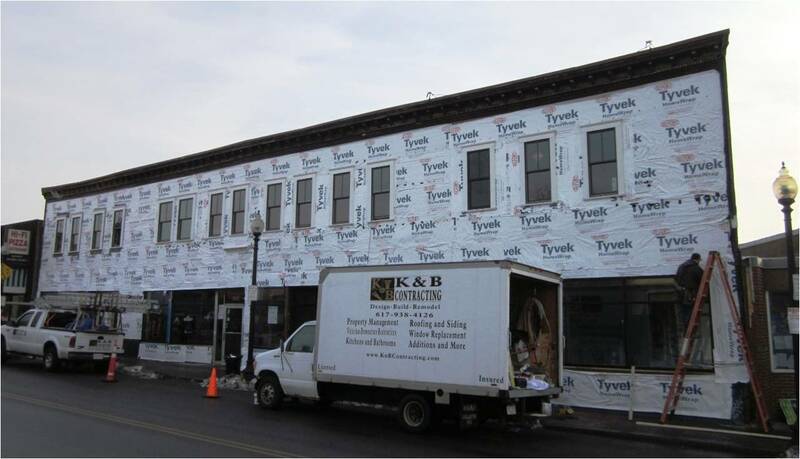 Stay tuned here for more project updates. 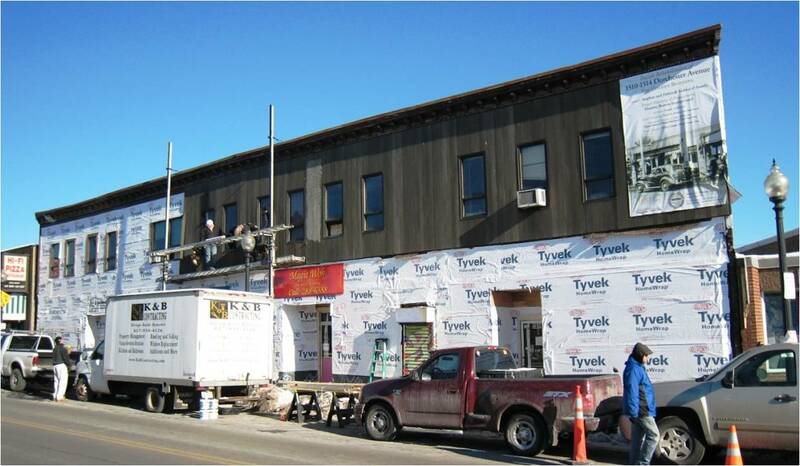 Jeff has recorded the project’s progress carefully over the course of the past several weeks. Here, we share some of those photographs in order of which they were taken. December 30, 2010: Golden Building on the second day of construction. 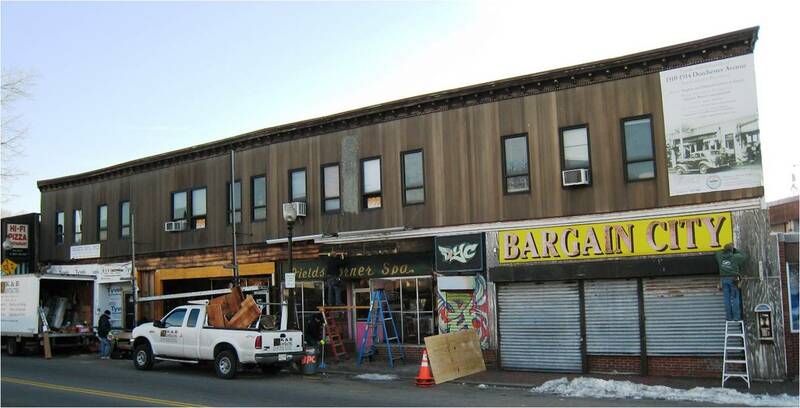 January 2, 2011: Old storefronts are disappearing. 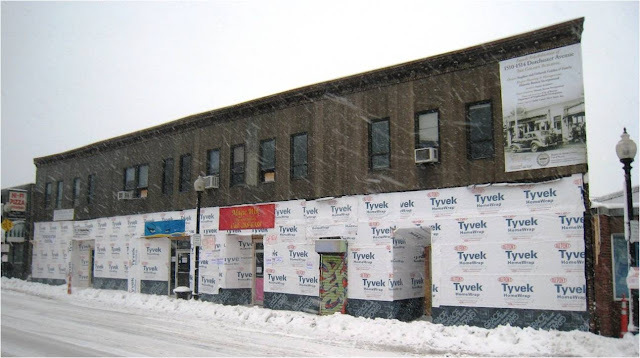 January 3, 2011: "Fields Corner Spa" sign revealed under layers of old signs. 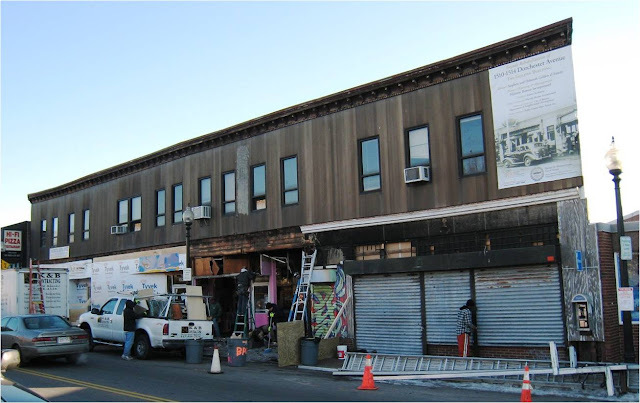 January 4, 2011: Original, fire-damaged transom window revealed above far right storefront. 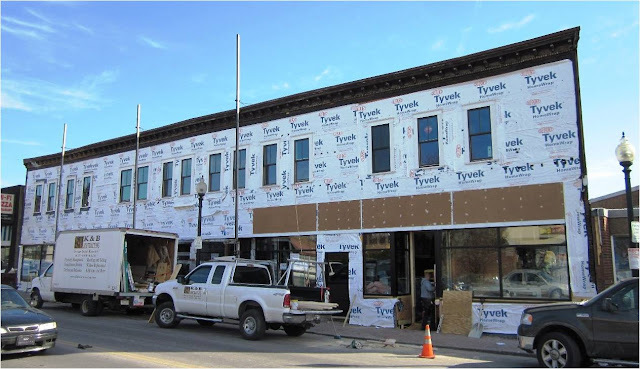 January 6, 2011: Storefront work progresses. January 12, 2011: Storefronts buttoned up on a snowy morning. 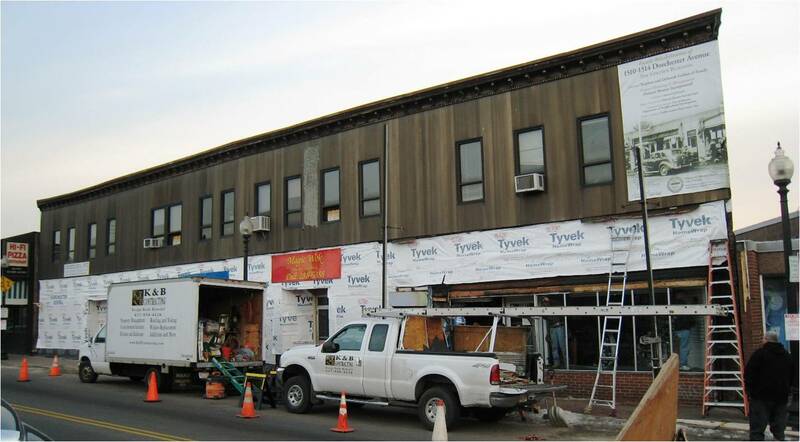 January 17, 2011: Siding removal begins on the second floor. 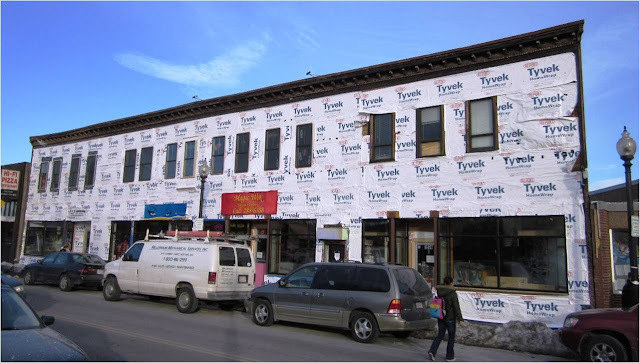 January 18, 2011: Second floor siding is half gone! 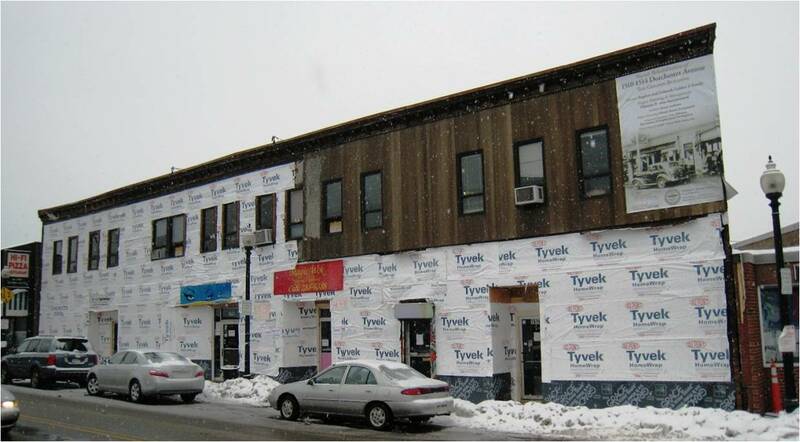 January 19, 2011: Note the thick layer of gray stucco visible under the brown metal siding. 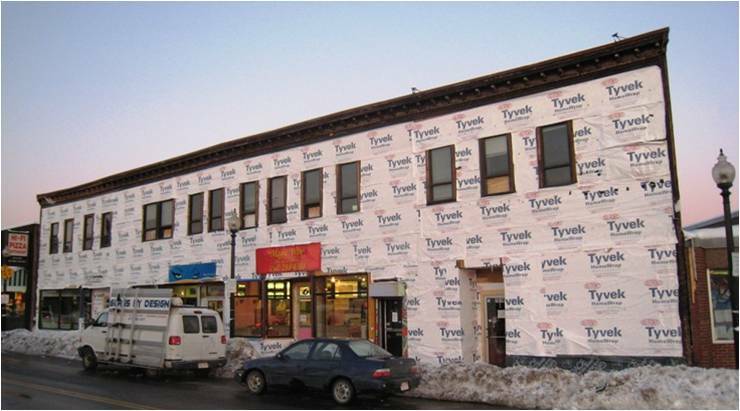 February 1, 2011: Second floor siding totally removed and storefront glass partially installed. February 3, 2011: More storefront glass in place. 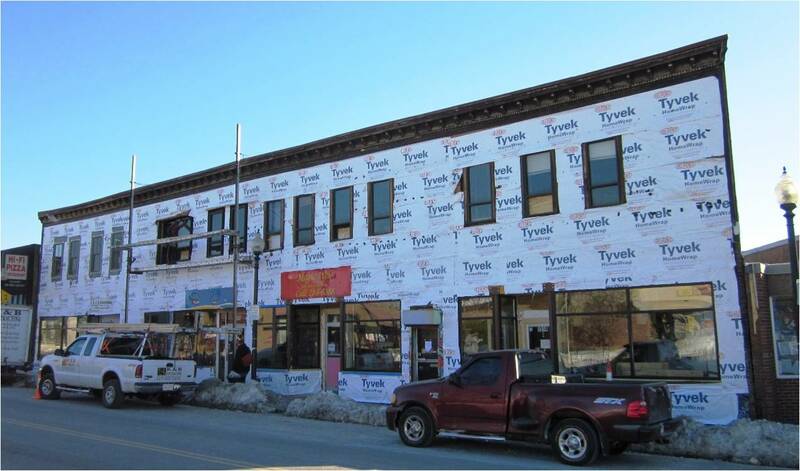 February 6, 2011: Final section of storefront glass in place. 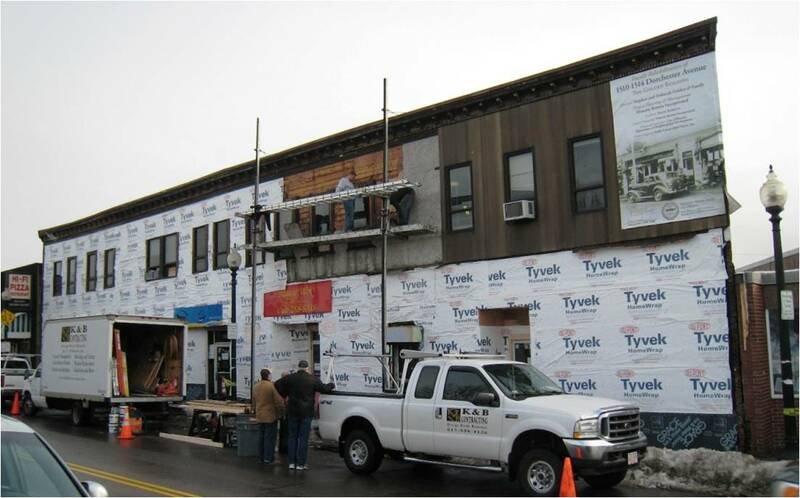 February 10, 2011: Installation of new second floor windows begins. 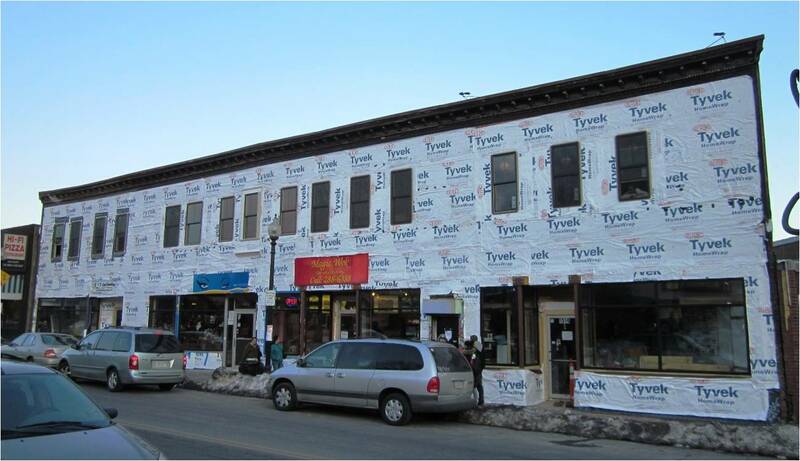 February 11, 2011: More new second floor windows in place. 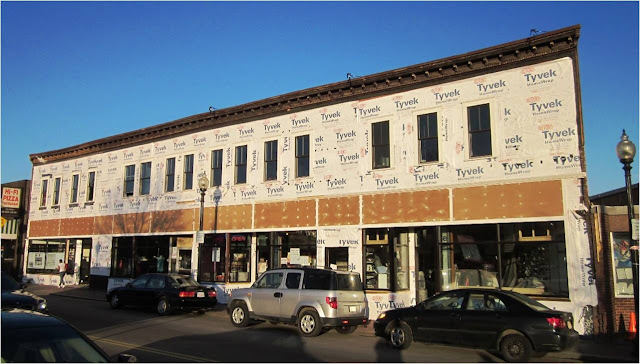 February 14, 2011: All second floor windows in place. February 18, 2011: Second floor windows trimmed out. 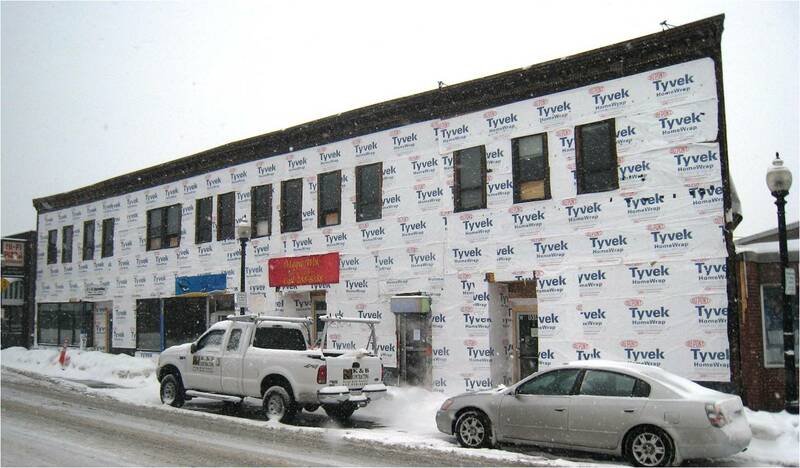 February 24, 2011: New sign board half in place. 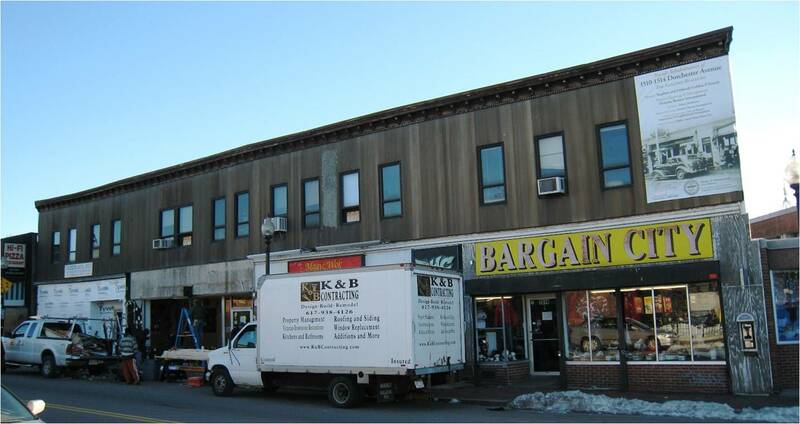 March 1, 2011: New sign board fully in place.